Premium tea growers in Sri Lanka specialize in the manufacture of brisk and fruity, orthodox black teas (long, whole-leaf teas). This tiny island located south of the tip of southern India takes its tea production very seriously – in most years Sri Lanka ranks 3rd or 4th in worldwide tea production. 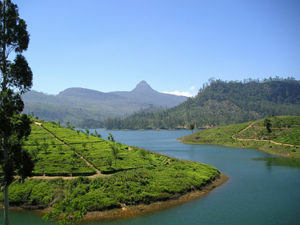 Tea is cultivated in high-grown, mid-level and low-elevation locations in the tea growing regions of Dimbula, Kandy, Nuwara Eliya, Ruhyna, Uda Pussellawa, and Uva. Each of these regions boasts a different microclimate and soil conditions that contribute to the unique taste and flavor of these teas. Additonally, the tea growing regions of Sri Lanka each experience a major seasonal monsoon period (occurring at two different times of the year) that is followed by the best cropping season of the year in these regions. Premium teas from Sri Lanka (marketed as Ceylon Tea) are perfect self-drinking teas (teas for drinking ‘straight’ without blending with other tea). Ceylon teas also feature prominently in many traditional and flavorful English tea blends.